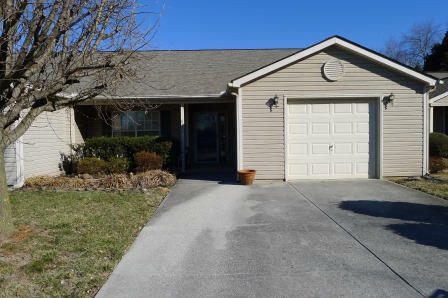 This West Knoxville home for sale is located at 8605 Sunpoint Road, in the Cedar Grove subdivision. It has 2 bedrooms, 2 baths, and an asking price of $134,900. This Cedar Grove home for sale has many upgrades and and been kept in fabulous condition. The family room is spacious and has a gas fire place. The family room opens up into the kitchen and dining area, making a great space to entertain. The kitchen has tons of cabinet and counter space, with plenty of space for cooking. The kitchen has been upgraded with stainless steel appliances and granite counter tops. There is also a bar area to sit at. This home also has two spacious bedrooms and two full baths. This home also has a large, partially covered patio. It also has a one car garage connected to the unit. This West Knoxville home for sale is located in a planned unit development, which means it offers maintenance free living. The monthly homeowner’s association dues are $75 per month and cover that maintenance of the subdivision. In addition to its many upgrades, this PUD also has a great location in West Knoxville. It is located near the intersection of Joe Hinton Road and Middlebrook Pike, making it convenient to many West Knoxville locations via Kingston Pike or the interstate. It is close to both the West Hills and Cedar Bluff area, both which have many popular restaurants and shopping destinations. Does maintenance free living in the West Knoxville home for sale interest you? If so, please let us know if there is anyway that Knoxville Home Team can assist you. Rick can be reached at 865-696-9002 or via email at Rick@KnoxvilleHomeTeam.Com. Kati can be reached at Kati@KnoxvilleHomeTeam.Com or by phone at 865-392-5880.